May 13, 2011: Manitoba Mountain recently has had some good crust skiing. More hiking than usual for this time of year has been involved to get up to the good snow. But the skiing conditions up high have been worth the hike. May 6, 2011: For many years I had wanted to crust ski on Bald Mountain Ridge. I had skied this ridge quite a few times in the past, but getting to this place during crust snow season proved to be tricky. The trails up Bald Mountain Ridge from the south melt out and get muddy quickly, the access from Hatcher Pass is avalanche-prone and the Dave Churchill Trail is tough to get up when Willow Creek's ice gives out. Luckily Willow Creek still had just enough ice to allow me to get across on this day, and I was finally able to crust ski Bald Mountain Ridge. I skied up the Dave Churchill Trail access to above tree-line and then skated this wide and expansive ridge top on to the State Trooper's communication station at the 4577' level. I also incorporated a side trip to check out the remains of a B-29 that crashed in 1956. Overview of route location. 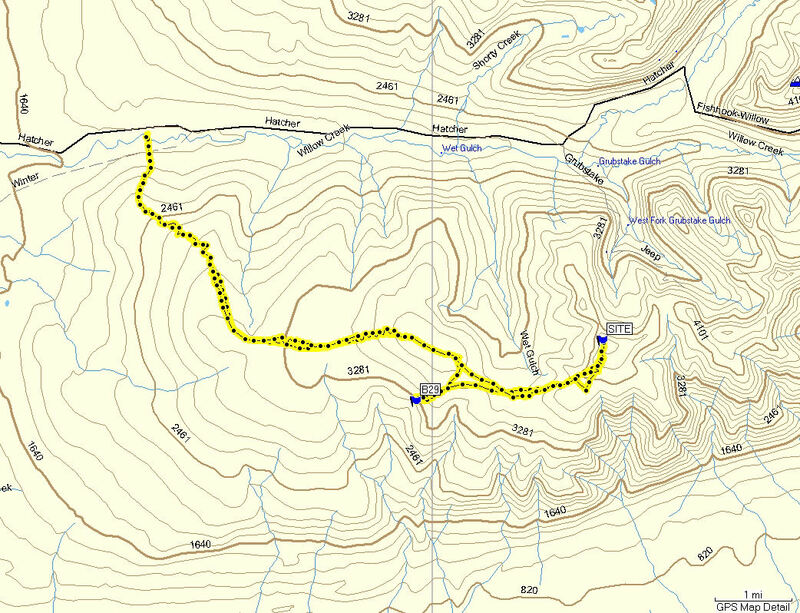 GPS track: 20 miles, 3000 feet of elevation gain. This sign on the Fishhook-Willow Road marks the start of the access trail to Bald Mountain Ridge. Heading up. You can see where the "Bald" part of this ridge's name comes from. I had tried to find this plane wreckage before (on skis), but I wasn't able to locate it. So this time I cheated and got the GPS coordinates off the geocaching web site (N 61 42.843, W 149 30.397). This wreckage is of a B-29 fuel tanker that crashed in 1956. Here is some info about this event. I wanted to visit this site to complete my "B-29 Troika", which is visiting all three B-29 crash sites in this general area: Bomber Glacier, the Delta Islands in the Big Susitna River NW of Willow and here at Bald Mountain Ridge. View from west to east from the 4577' point on Bald Mountain Ridge where a State Troopers communications site is located. Ahhhh! Crust tarantula !!! View of the Knik Glacier in the distance. The dark thing on the snow at the left of this picture is a ground squirrel. The top of Bald Mountain Ridge is completely white, except for many brown ground squirrels sitting on the snow next to their burrows. I must have seen 200 of these little guys. Looking back at the communications station on the 4577' point of Bald Mountain Ridge. Is crust skiing safe from avalanches? Definitely not. This picture shows where a snowmobile was going up crusted snow and triggered a slab avalanche. The upper layer had a thick crust on top of it, but it was tenaciously resting on top of a super-slick layer of icy rain crust. When it comes to the Hatcher Pass area, I like the west (Willow) side the best. 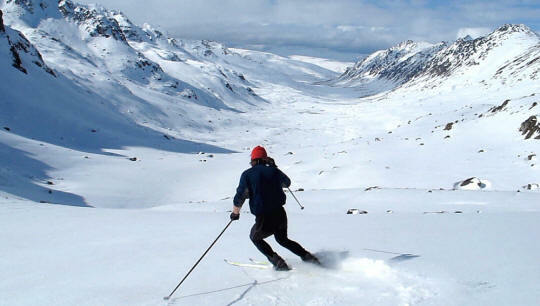 There is 10 times more skiing terrain and 1000 times less people than the east side. Places like Bald Mountain Ridge and Craigie Creek (see below) are rarely ever skied. 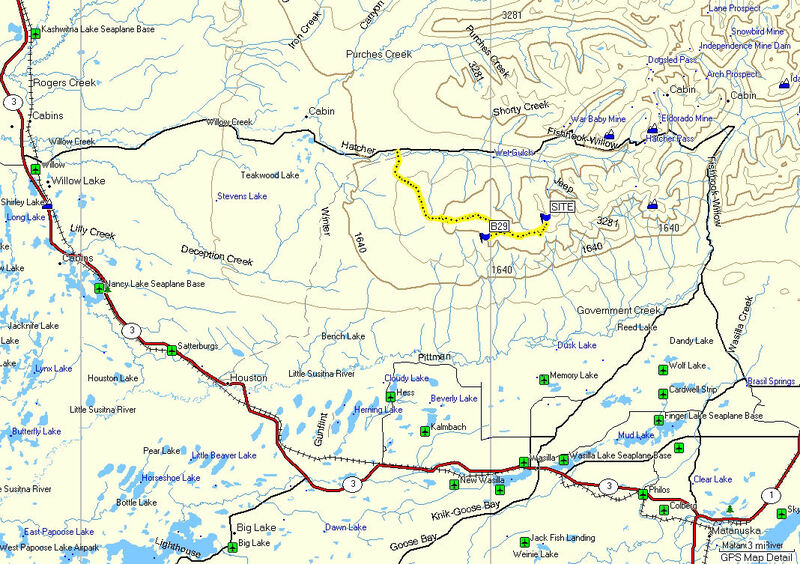 May 1, 2011: I had been to Dogsled Pass, at the head of the Craigie Creek drainage in the Talkeetna Mountains, several times before while hiking, mountain biking and snowmobile trail skiing. But I had never crust skied to Dogsled Pass. Craigie Creek is usually a bit hard to get to for crust skiing. But for the last two winters the Fishook-Willow Road east of Willow on to Craigie Creek has been kept plowed-open. In past years this road was usually unplowed all winter and not opened until the end of May. So I figured this extended road access would allow some easy access to new crust skiing terrain. The crust skiing in Craigie Creek was good. There was a little bit of new powder on top of the crust, so I'd give this crust skiing a rating of 7 out of 10. It could be good skiing here for another two weeks or more if we have normal-ish spring freeze/ thaw cycles in the Talkeetna Mountains. Looking down the Craigie Creek drainage from the old cabin near Dogsled Pass. Old penstock and mining building. Cabin near Dogsled Pass. Nearing the pass. Dust (3/8 inch of powder) on crust. A rarity ... driving the Fishook-Willow Road to Craigie Creek in early May.